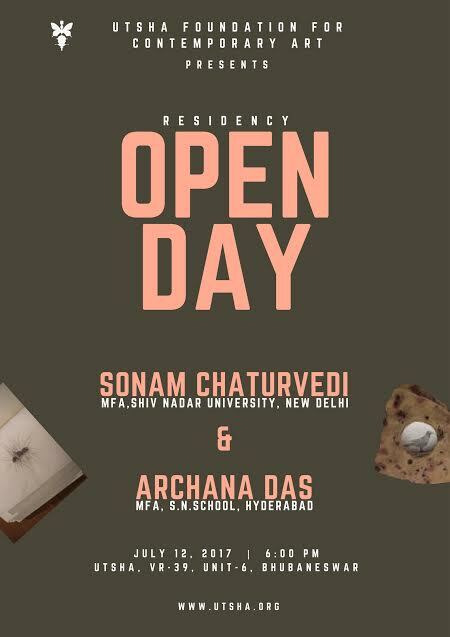 Bhubaneswar: Utsha Foundation For Contemporary Art, Bhubaneswar is hosting the Residency Open Day for two talented young visual artists – Sonam Chaturvedi and Archana Das. Both the artists have been part of the month long Utsha Residency from June 15 – July 15 , 2017. They have explored the rich cultural heritage of Bhubaneswar and immersed themselves in the peaceful surroundings of Utsha Foundation to develop their practice. Archana , a printmaker by training, explores how in today’s world familiar objects from her childhood have lost their characteristics and purpose and returned back to nature. She uses prints and mixed media to display these ideas. Sonam uses video to display the concept of timelessness and how the surroundings of Utsha have resonated with her on this. She uses mixed media scattered over the grounds to outline her journey via found objects that she had collected along the Mumbai coast that serve as event markers of the past. Both exhibits will be on display on July 12 , 2017, at 6 PM on the Utsha Foundation grounds as part of the Residency Open Day. Utsha Foundation is located in the 2nd Lane behind Bhubaneswar Club at Qtr VR-39 , Unit 6 , Bhubaneswar-751001. Sonam Chaturvedi is a visual artist based in Baroda. She holds a Master’s in Visual Arts from Shiv Nadar University Delhi and a Bachelor’s in Visual Arts with specialisation in Sculpture from MS University, Baroda. 2016 ‘Imagined Futures Reconstructed Pasts’ curated by Meera Menezes, presented by Anant Art gallery at Bikaner House, New Delhi. 2016 MFA group show of Shiv Nadar University, Kiran Nadar Museum of Arts, Noida. 2013 Alternative Photography Show at Printmaking Department, Faculty of Fine Arts, M.S. University of Baroda, Vadodara.